The Self unfolded itself with a pulsation and this pulsation is the start of Absolute time (KAALAM). This is the point of singularity in the scientific language and the event is termed as Big Bang. As we saw earlier it was an event of primordial pulsation and not of an explosion which threw away mass because of the explosion into the space. The entire space existed with its subatomic particles and this pulsation made the space to vibrate and this vibration was rhythmic and led to the evolution of this universe. Popularly known as “That one became many”… and ..Vastur eva Vaastu. The Absolute Time started. This is called Kaalam. Primordial and the most sacred Pranava emerged. Luminescent form as OM the Light. This is the source of all visual forms. The primordial form is represented as ஓம் in Tamil and ॐ in Sanskrit. Aural form as OM the Sound. This is the source of all aural forms. This is more popular form compared to the luminescent form. Now this concept is very important, since in the Pranava meditation they say us to meditate on the silence after the word OM and also mediate OM as light, OM jyoti rasaha in vedas. So, when we say that sound merges into light, it is all the aural form merges into its luminescent form. All luminescent forms merge with the Paramaanu which is also luminescent. Siddhar Thirumoolar states brilliantly that who realizes that the light (physical light which means the world) merges with light (subtle light), he has realized SIVA (Consciousness). Now let’s come to the 8×8 energy grid of the Paramaanu and imagine that it is pulsating because of Pranava and this Pranava has both light and aural form. They say that this pulsation is rhythmic and symmetric. When something is Symmetric, then there has to be a central line along with the Symmetry comes. For example if our right and left sides are symmetric then the body is divided along the sternum & backbone. Within the 8×8 energy grid / hall there is a vertical luminous shaft called Brahma Sutra (Oli nool). Sutra in Sanskrit and Nool in Tamil means Thread / String. This Olinool / Brahma Sutra is a shaft of consciousness also called Moolathoon / Moolasthambham. This shaft of consciousness vibrates in a particular order called rhythm. This is the order of nature. 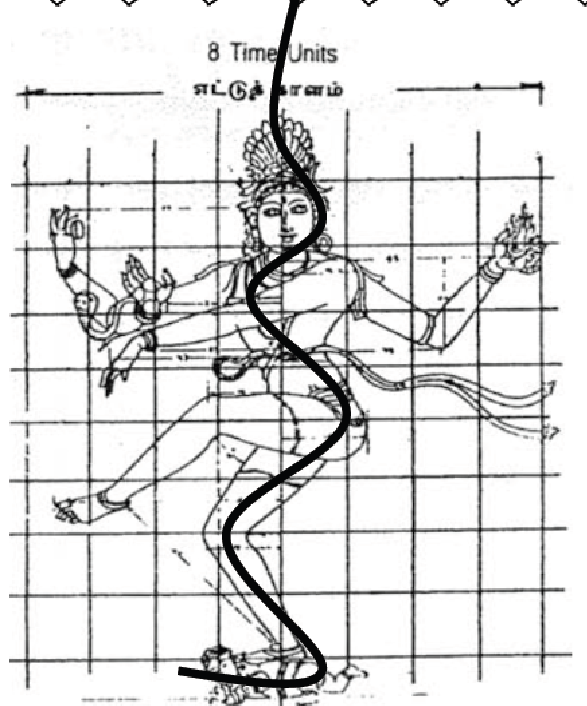 This rhythmic vibration of the shaft of consciousness is the dance of Siva, the CELESTIAL DANCE / THE COSMIC DANCE / THE DANCE OF EVOLUTION of the NATARAJA. Look again at the picture of NATARAJA, he is drawn inside a 8×8 Manduka mandala (now you know what it is), his left leg is raised suggesting a movement from left to right. Imagine that he is going to land the left leg to his right side. Tomorrow we will reasoning behind it and explore more on this. This entry was posted in Religion, Science, Spirituality and tagged articles, education, inspiration, life, philosophy, religion, research, science, spirituality, thoughts by Ganesh. Bookmark the permalink. Thought creates, creation manifest, thought manifests.